April 11, 2010Each of India’s 28 states has its own government-run house for state affairs, known as a bhavan, in the bustling capital city of New Delhi. And most of the bhavans have a canteen that specializes in regional cuisine, whether it’s the coconut-infused dishes of the southwest state of Kerala, or the Chinese-style momos, or dumplings, of Sikkim in the northeast. Photo: Keith Bedford for The New York Times. 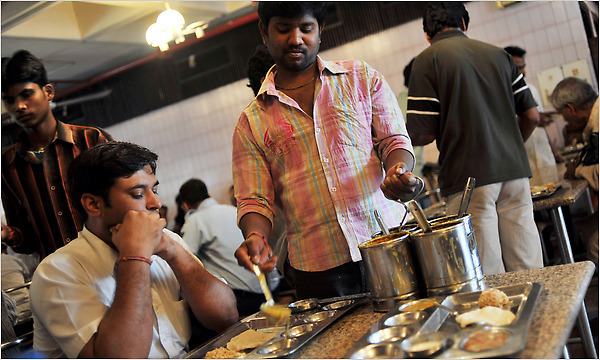 Like those of the other 27 states, the cafeteria at Andhra Pradesh’s center in the capital serves its regional cuisine. But the Tamil Nadu House, a ziggurat-shaped concrete building where this 18-table restaurant is located, is nowhere near the warm waters of the Bay of Bengal. Rather, it is tucked in an affluent neighborhood of New Delhi where it’s possible to sample India’s entire culinary landscape by taxi. Each of India’s 28 states has its own government-run house for state affairs, known as a bhavan, in the bustling capital city of New Delhi. And most of the bhavans have a canteen that specializes in regional cuisine, whether it’s the coconut-infused dishes of the southwest state of Kerala, or the Chinese-style momos, or dumplings, of Sikkim in the northeast. Nearly all the bhavans are clustered in the leafy streets of Chanakyapuri, the capital’s diplomatic area, so an adventurous eater can embark on a gastronomic survey of India without leaving the neighborhood. While not all the canteens are open to the public, most welcome walk-ins. An even bigger draw is the price: in a city that is expensive by Indian standards, a meal for two at a bhavan rarely exceeds 300 rupees, or about $7. A thali, or sampling of dishes, was served on a metal platter with indentations that resembled a painter’s palette, as well as in small metal bowls. They included a curry of miniature eggplant smothered in a piquant gravy; a pale groundnut chutney reminiscent of peanut butter; sambar, a watery lentil broth; rasam, a tangy tomato broth flavored with tamarind; cooling yogurt; and a double ka meeta, a special Andhra bread pudding soaked in cream, sugar and ghee. While the rice dishes of Andhra Pradesh may be familiar, the food of Jammu and Kashmir — the northernmost state of India situated in the Himalaya mountains — is less so. It is also India’s only state with a Muslim majority, and spicy kebabs and lamb dishes are its signature. One building holds the dining room, which has tile floors and white walls that are sparsely decorated with faded pictures of Kashmir’s snow-capped mountains. Curtains were drawn over large floor-to-ceiling windows. On a Thursday night, the six big wooden tables were occupied by men in taqiyahs, the caps worn by some Muslims. It’s not hard to find kebabs in Delhi, but dining at Jammu and Kashmir House offers the special treat of eating from a ceramic plate with the state seal: a lotus and two swans. Still, the no-frills canteen is a far cry from the idyllic landscapes of Kashmir. Not all the bhavans are so utilitarian. Nagaland in northeast India is one of the country’s smallest and most remote states — so it was surprising that the dining room at Nagaland House was relatively formal. Housed in a three-story white villa with green trim on Aurangzeb Road, a fancy boulevard lined with expensive homes and government residences, the canteen had five tables that were covered with white tablecloths and lavender place mats laid with cutlery and ceramic plates. Nagaland is known for its green mountains and the folk traditions of the Naga people. But tourists need permits to visit — the state is plagued by rebel insurgencies — so a visit to the canteen may be the closest that many people will ever get to tasting Naga specialties like smoked pork stir-fried with bamboo shoots, and pork stewed with nushi, the leaf of a local yam. Unlike in most of India, pork is eaten with zeal in Nagaland. Andhra Pradesh Bhavan (1 Ashoka Road, near India Gate; 91-11-2338-7499; aponline.gov.in/apportal/apbhavandotcom/Location.htm) is among the most popular spots. Open daily 7:30 to 10 a.m.; noon to 3 p.m.; 7:30 to 10 p.m. Dinner for two, about 160 rupees, or about $3.65. Assam Bhavan (1 Sardar Patel Marg, Chanakyapuri; 91-11-2687-7111), in a small basement, serves fish and unusual vegetarian dishes like custard apple curry. Daily 1 to 2:30 p.m.; 8:30 to 10 p.m. Meal for two, about 120 rupees. Jammu and Kashmir House (9 Kautilya Marg, Chanakyapuri; 91-11-2611-2021) is known for its lamb kebabs. Not to be confused with Jammu and Kashmir Bhavan. Daily 7 to 9 a.m.; noon to 2 p.m.; 7 to 10 p.m. Meal for two, about 180 rupees. Kerala House (3 Jantar Mantar Road, near Jantar Mantar; 91-11-3041-1411) serves coconut-infused dishes in a peaceful setting. Though it is not officially open to the public, walk-ins are welcome. Daily 8 to 9:30 a.m.; 1 to 2:30 p.m.; 8 to 9:30 p.m. Meal for two, 80 rupees. Nagaland House (29 Aurangzeb Road, near Delhi Race Course; 91-11-2301-5638) serves unusual pork dishes favored in this remote northeast state. Daily 8:30 to 11 a.m.; noon to 2 p.m.; 7 to 10 p.m. Meal for two, 220 rupees. Sikkim House (14 Panchsheel Marg; Chanakyapuri; 91-11-2611-5171), across from the United States Embassy, draws the diplomat set. Daily 8:30 to 10:30 a.m.; 12:30 to 11 p.m. Meal for two, about 250 rupees. Tamil Nadu House (Off Africa Avenue; Chanakyapuri; 91-11-2419-3100) serves South Indian fare in a basic canteen. Daily 8 a.m. to 10:45 p.m. Meal for two, about 150 rupees.